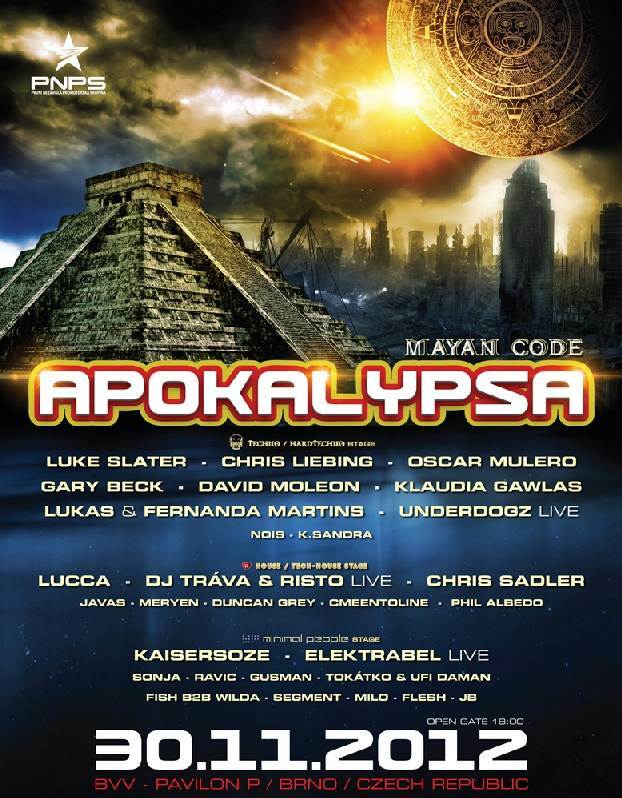 The 35th Apokalypsa night, the most famous Czech and Slovakian indoor event, is inspired by the Mayan prediction of the end of the world as we know it. How is it going to end up, we will certainly find out by the end of this year but it is clear now already, that the greatest indoor techno party in Czech Republic will take you deep into the world of the Mayan mythology, into the mysterious and precisely crafted numerology space. On the 30th of November 2012 the P Pavilion is going to turn into a gigantic temple devoted to the Mayan gods and traditional time machines which will countdown the coming of every single new saviour. Luke Slater, Chris Liebing, Oscar Mulero, Gary Beck, David Moleon, Klaudia Gawlas, Lukas & Fernanda Martins, UnderDogz Live, K.Sandra, Nois, Lucca, Tráva & Risto Live, Chris Sadler, Javas, MeryEn, Duncan Grey, Phil Albedo, Cmeentoline, KaiserSoze, Elektrabel Live, Sonja, Ravic, Tokátko, Segment, Flesh, Marty Fish, Gusman, Ufi Daman a many more.. 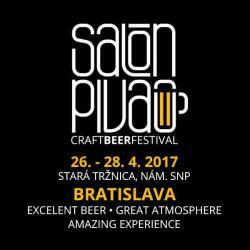 In its parameters, the P pavilion is the greatest hall of the kind in central Europe. The space was constructed to host any musical event providing the highest acoustic quality possible. It´s walls are double-coated with a permanent air pressure. The visitors will use a comfortable gate Nr. 7, or if driving in by car, the gate Nr. 9. There is a plenty of parking spots, a nearby bus stop and a generously dimensioned meeting place at the gates 7 and 9. Tickets are currently sold at Ticketportal, at the prices 20 EUR, 40 EUR a VIP GOLD 100 EUR. Ticket prices can be raised without prior notice! Ticket sat the spot (at the main ticket office) will cost 35 EUR.